Aaro Aakash, a ‘natural’ living place on the outskirts of Bolpur. Aitrayee Sarkar shares the rules made by the nature, not by tourists at all. Regular visitors to Shantiniketan often complain about growing traffic, huge hotels and resorts lapping the city around and thousands of over-enthusiasts behaving more ‘cultural’ than the land itself. Now-a-days you would hardly get to smell the ‘red-soil’ of Birbhum at least in Shantiketan. The land has been engulfed by a massive wave of urbanization. All one can do is to look beyond the town. Explore rural belts around the main urban hub. 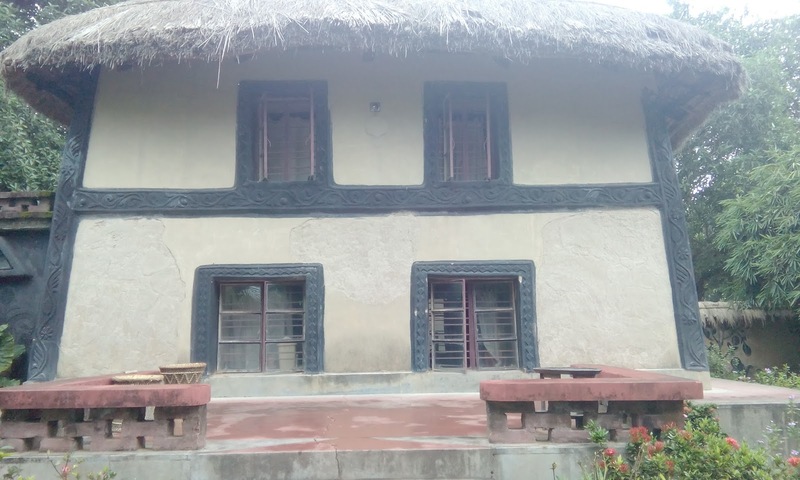 If you have the thirst for experiencing glimpses of real traditional ethnic Birbhum then visiting Aaro Aakash is a must. Let me make it very clear that Aaro Aakash is not a well-equipped modern resort. In fact, it’s a non-resort. It’s located at the Kamarpara village, on the By-pass road from Bolpur to Ilambazar, only 20 km from Bolpur Station. It takes only 30 minutes by road to reach there. Besides, hired cars one can avail bus service too. Living at Aaro Aakash means indulging yourself in village life of Birbhum. They offer couple of single and multi-storied mud houses, called Ekka and Dokka respectively, for tourists. Remember there is no air condition or television sets around. There are rope-made beds or Khatias and earthen water-pots to welcome you. The living space is decorated with mud-work and roofs are straw-made. They do not administer any kind of pesticide or chemicals, so if you are sacred of insects then Aaro Aakash is a big No No for you. You must be wondering whether I am trying to discourage the weekend trip that you have already stated to plan. No, not at all. The best gift that Aaro Aakash offers to its visitors is the bounty of natural beauty—a clear sky that has almost obliterated from our vision, a number of unknown trees, humble and caring behavior of the villagers serving as staffs there. I bet, after visiting Aaro Aakash, you would surely come up with new ideas of how to use recycle materials in your own house. The makers of Aaro Aakash hate the concept of makeover, they, instead believe in transformation keeping the roots alive. Take the pond located within the premises for example. They maintain it properly and use the water of it. But there is no effort to construct any concrete structure over it. It’s encircled by simple bamboo sticks only. They use low-power bulbs to save electricity which is a must in Aaro Aakash. The best time to visit the place is winter I guess. But a full-monsoon would not disappoint you at all. With frogs moving here and there and unseen reptiles making wired sounds, it’s a real treat to your heart. 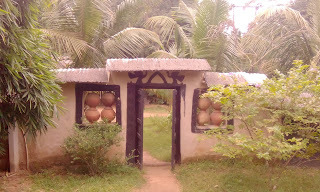 A part of the earnings of Aaro Aakash is used for development of the village itself. The idea is to make the villagers self-reliant so that no developer can fool them and grab their lands. Hence, discussing prospective land-dealings with the staffs is not permitted there. Aaro Aakash discourages over-enthusiasts. So it’s not a place for people who go overboard. You have to follow the rules of nature; otherwise nature would not open its arms for you.